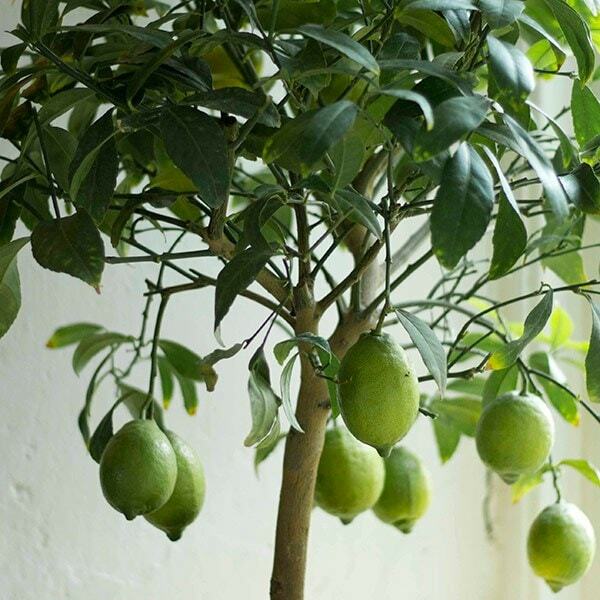 The plants may not arrive with fully developed lemons, but they are top-notch, quality plants. Garden care: Ideally grow in a pot which is easily moved from terrace to conservatory, in soil-based compost. Feed every two weeks with a special citrus fertiliser (there is one for summer and another for winter), and pot on or top-dress plants in late winter. Move outside after the risk of frost has passed to a sunny, sheltered patio. 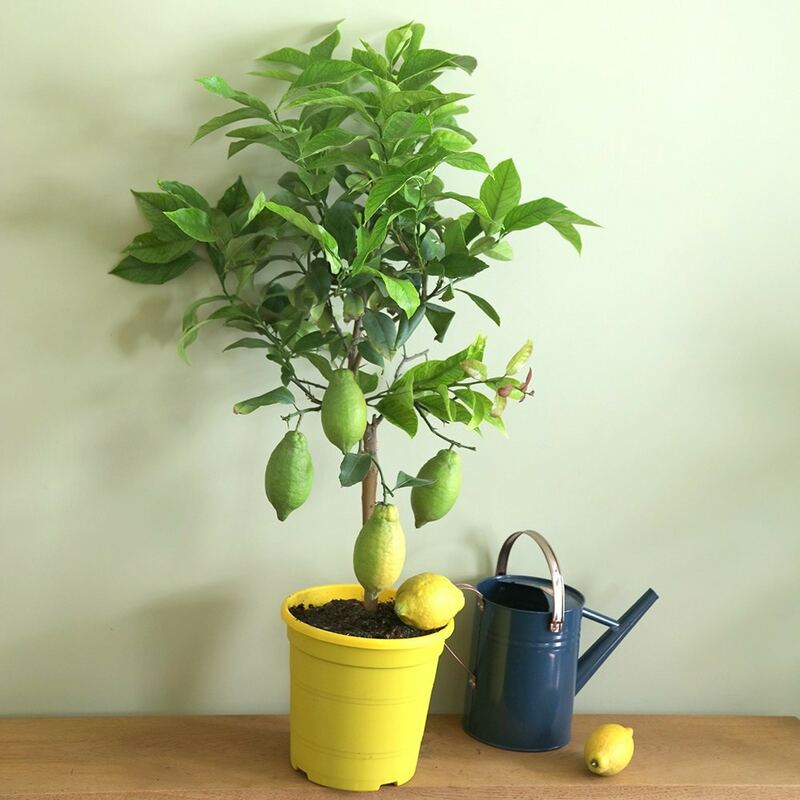 I bought this lemon tree as a gift for my partner April 2018. It has grown in size & has flowered continually since then till now. We have brought into our conservatory over the winter & it's ok, so far. I am very happy with my Lemon Tree. The lemon Tree has been in flower for several months and the lemons, about 12, which were on the plant when it arrived are just going yellow. we have become firm friends over the past 9 months! It needed a bit of attention when outside, as the pot and base are quite light and it easily falls over in the slightest breeze. Have had to put in a more solid pot. It's been very happy since it came in for the winter, about a dozen fruits are ripening and another dozen flowers are turning to fruit. It will need repotting before it goes back outside. Given as a gift, fascinating to see the lemons grow. Wanted this for the patio and its a beautiful plant. Looking forward to using the lemons. We bought this lemon tree for our very sunny conservatory and we love it. It bears fruit and flowers all at the same time and is really attractive to look at. It looked so healthy and strong when it arrived and it's done brilliantly. We love it! I am biased as I love all Crocus plants!!! Had to wait a long time for the lemon tree to come but it was worth it. Looked rather sad to start with b ut it recovered and survived in the Conservatory during the Winter. Lovely flowers and a few tiny lemons which have now dropped as I put it in the garden for the Summer and I think it was a bit too windy..... my fault not Crocus!!! In general very pleased with it and hope it will last for years. It arrived very will packed as with all Crocus plants. Was bought as a present and was feed with appropriate food during summer and winter. Was kept outside in summer and in greenhouse in winter. One year on and it seems to be dead/dying no idea why very upset. Hello It is quite common for some of the flowers to drop off and not develop into fruits, but if this is excessive then this can be caused by dry roots and lack of humidity. As a rough guide a 1m tall tree should bear maximum of 20 fruits. However if there is a sticky fluid oozing from the leaves this sounds like it has an infestation. Lemon trees can be prone to scale insect, mealy bug or red spider mite so I would have a good look at the stems,and under the leaves to see if you can see any of these pests. There are no hard and fast rules as it will depend on the variety, however I would say, you should get the biggest pot you can find if you want the plants to reach their full height. Do these have fruits on already? Hello, Often these plants are laden with lemons, however this is not something we can guarantee. Before I order a lemon tree, can it be pruned and if so when would be best? I see they can get to 6m high (or am I reading the instructions wrongly?) I couldn't move a large tree into our greenhouse. Many thanks. 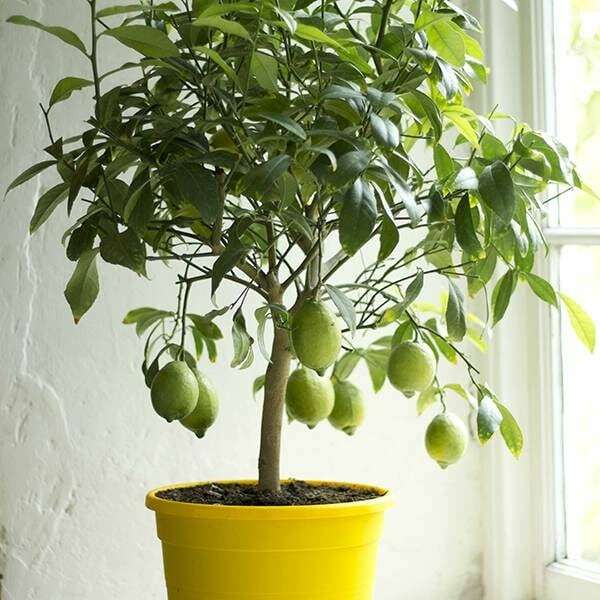 Hello, If this lemon is grown in a pot, then the height will naturally be restricted, and while little pruning is needed by the plants, you can thin them out, or cut back leggy plants in late winter, while pinching out the growing tips in summer will help encourage bushier growth. Our lemon tree survived its first winter in our house and has now (early April) produced a few small flowers, but we are concerned about the new growth that has appeared at the top of the tree since mid-February. The new growth consists of fast-growing shoots with large, pale-green leaves. Some of these leaves are five times as big as the older dark-green leaves. Googling around I find very little about this situation -- one site talks about pale leaves on lemon trees indicating a zinc or iron deficiency; another site said that large/oversized leaves on a lemon tree might indicate too little sunlight; other sites talk about "water sprouts" as a harmless type of growth, or one that should be removed because it produces little fruit. Do you have any ideas about whether it is normal, what might be causing it, and what to do? Thanks! Hello, If the shoot is definitely not appearing below the graft union, then I suspect it is a water shoot, so I would simply cut it back to a within a couple of buds from the main stem. I'm so sorry - I've already asked this question but got the question slightly wrong... The question was can we over winter in an unheated greenhouse (last time I accidentally wrote unheated conservatory which I guess are usually warmer than unheated greenhouses). And if so will it need to be protected with fleece? Hello, Yes and unheated greenhouse should be fine too - and whether or not you will need extra protection will depend on how cold it gets in your area. They tend to be fine in temperatures down to 7C, so you may need to fleece in conditions below that. Hi there... I'm keen to have a lemon tree but we do not have a conservatory and our old cottage is not exactly flooded with light. Can we overwinter in an unheated conservatory? Thanks. Hello, Yes, this sounds ideal! 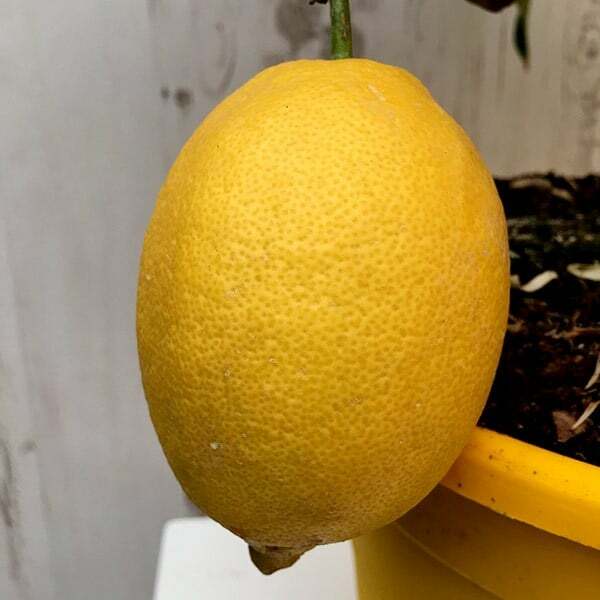 Just received my lemon tree this week and whilst having 4 lovely big lemons on it, many of the older leaves have yellowing leaf edges and brown tips. The newer growth of large leaves is also a paler green, not dark or glossy and starting to mottle. What do I need to do to help it recover and get established please, or do I need to send back? Hello, These plants are currently around 40 - 50cm tall and they currently don't have any fruit. Hi. Got our Four Seasons lemon tree from you earlier this year and it is doing well. Maybe too well! It now has 7 lemons on it (of varying age) with the oldest just starting to turn yellow. The question is should we be thinning off some of the fruit? The tree is about 750mm high and 600mm diameter and is growing well but we don't want to over-exhaust it! Any ideas welcome. Hello there It sounds very healthy! One of the benefits of this lovely tree is that it is a heavy cropper and you can have fruits of varying different ages on one plant. I wouldn't thin the fruits out yet. As long as you are switching to the winter citrus feed it should be fine. As a rough guide a 1m tall tree should bear maximum of 20 fruits. http://www.crocus.co.uk/product/_/winter-citrus-feed/classid.1000000237/ http://www.crocus.co.uk/product/_/summer-citrus-feed/classid.1000000238/ Hope this helps.